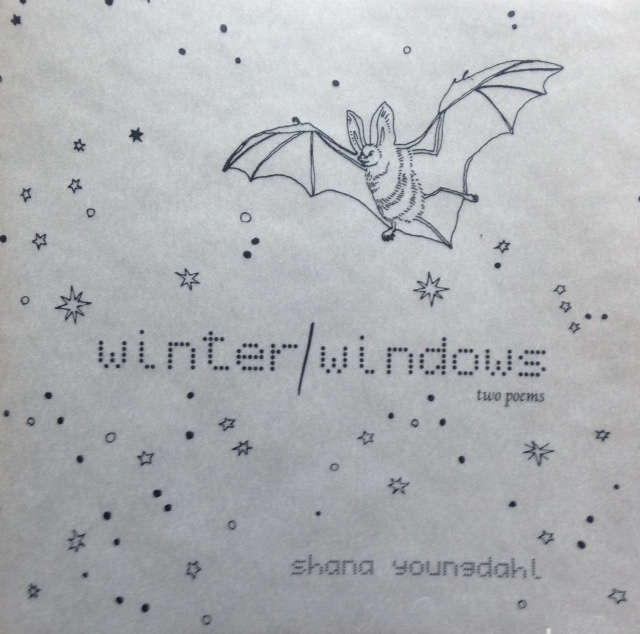 It’s a lovely thing to have the opportunity to talk about Shana’s chapbook Winter/Windows, which is about many things, but perhaps most centrally about bats and little girls. 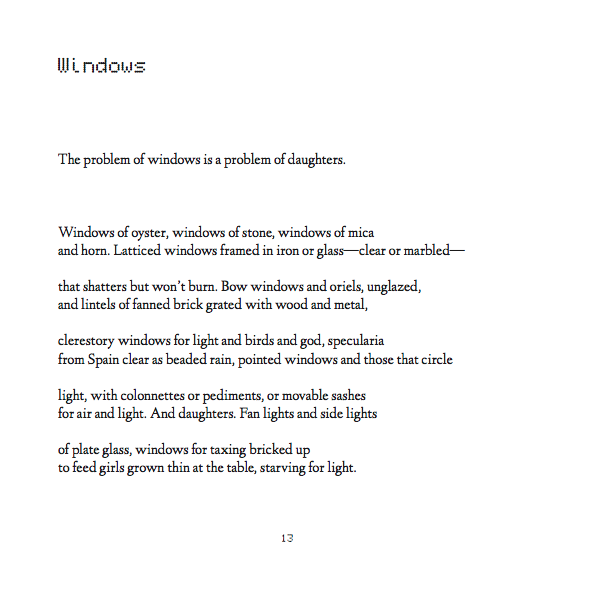 I want to start by just reading the first page of the second poem in the chapbook “Windows,” which I think will be more than enough for you to realize you should go online immediately after this event and have one of these beautiful little books shipped to you from Belgium. The whole book is like this: lush, deft, gorgeously intelligent, unremittingly intimate. And that word, intimate, reminds me of the other thing I want to say, which is about chapbooks. Chapbooks originate in the early modern period and are a form of cheaply produced printed matter: they were sold by peddlers who traveled across England during a time when literacy was growing but bound books were still expensive. Chapbooks were and are brief, one signature, saddle-stich affairs with paper covers, relatively easy and inexpensive to make and to distribute. Chapbooks have had a bit of a resurgence in the world of contemporary poetry in recent years in part out of a desire to return to something like that alternative model of distribution and production: something more personal and less commercial than the trade presses can offer. I mention all that because if you read Winter/Windows —which, again, you should, as soon as possible—I think you’ll see immediately that these intimate sensibility of these poems is perfectly matched to the beautiful hand-stitched book in which they are published by the wonderful Éireann Lorsung, herself a poet, of MIEL books. If you order Shana’s book, you will receive it carefully wrapped in a beautiful package; it will take a little while, because it will come to you not from an Amazon distribution center but from a farmhouse in the Belgian countryside, and you will realize when you open it that you have received not a product but a gift. I’m enormously for grateful for the gift of Shana’s poems, and you will be, too. The UMF community celebrated faculty who published books in 2013 and 2014 at a reception on March 10. Each faculty member’s book was introduced with remarks from another faculty member, a nice (and relatively new) UMF tradition. 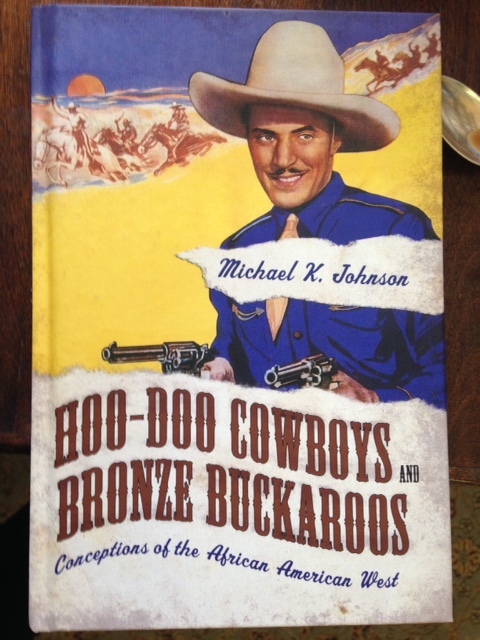 Michael Johnson’s book Hoo-Doo Cowboys and Bronze Buckaroos: Conceptions of the African American West examines representations of African American experience within, alongside, and against the tropes of the western frontier. If the terms “African American” and “Western” conjure little for us beyond Blazing Saddles, this reflects a kind of cultural erasure, since, as Michael writes in the introduction, “From the earliest incursions into the Americas by Spanish explorers to the California Gold Rush and the Oklahoma land rush, African Americans have been present at every frontier and have been active participants in transforming those frontier settlements into thriving communities.” Indeed, Derrida’s concept of writing-under-erasure, whereby meaning is both effaced and still present, is central to the book, a measure of its theoretical reach, which also encompasses the trickster archetype, and WEB Dubois’ formulation of double consciousness, concepts he uses to attend to a broad array of previously neglected material, including films, memoirs, and newspaper accounts. The result is a rich and meticulously researched look at a history that, though amply recorded in multiple genres, has been nevertheless rendered culturally all but invisible by the predominance of a whitewashed story of the “the West.” If in stressing the theoretical and methodological range of Michael’s book I have made it sound at all dry and scholastic, I want to close by saying that Hoo-Doo Cowboys and Bronze Buckaroos is above all a great read—compellingly written and full terrific stories. Michael tells these stories, from those of important cultural figures like WC Handy to those of the now little-known newspaper writer Rose Gordon, with both sympathy and intelligence, and the result is a book that not only gives is a new picture of the American West but that also reminds one how much fun an academic book can be, a fact of which all of us surely could use reminding. What Can I Do With a Major in English?